I’m surprised that Oblomov is not a more famous novel. Of course, maybe surprise is silly, since the fact that I read it 150 years after it was written (and in a different language) shows that it’s more famous than 99.9% of all published novels. It’s a very subtle book. The hero is Ilya Oblomov, who’s a really, really lazy nobleman. So lazy that he spends all his days drowsing in bed in his dusty room. In fact, about 20% of the novel goes past before he gets out of bed. There are no clear answers in the novel. Because, on one level, Oblomov is living the dream. He’s quite content to let the days fly past in this way. And you’re left wondering: isn’t life all about finding some sort of ease? If Oblomov has managed to find it, then why does the book keep poking him and condemning him? And you’re never sure. In the end, Oblomov’s life isn’t great, but it’s better than that of other characters in the novel. About a third of the way through the novel, Oblomov falls in love. And that’s where the novel gets really crazy. I’ve never seen a book that was so deeply interior. Goncharov seems obsessed with charting each twist and tangle in the characters’ thinking. One moment he’s filled with undying love, and the next moment he’s deeply uncertain. One moment his love, Olga, is willing to sacrifice her entire life and her virtue for him. And the next moment, she’s a bit bored by him. Each time they feel something, they’re completely sure about what it is. But then they stop feeling it and are sure about something else. Oftentimes with no external stimulus! It’s the lack of action that makes the novel so interesting. In most books, circumstances guide emotion. People fall out of love because something happened. In Oblomov, nothing happens. Their minds just change. In many ways, it feels much more realistic and accurate than most modern novels. The only downside to the novel is that it’s considerably overwritten. I think I could’ve gone through with a red pen and cut about 30% of it. And the focus on the interior life of its subjects means that the overwritten elements are just rumination. When excess bits are dialogue or setting or action, you at least feel like you’re gaining some understanding of place and character. But when they’re rumination, it’s all kind of pointless. Maybe that’s why the book isn’t as well known as those of Goncharov’s contemporaries. 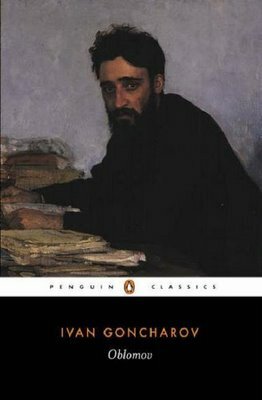 Still, I’d say that I prefer it to, for instance, Gogol’s Dead Souls, which is a book that treats the same themes and a similar milieu, but with a purely satirical eye. Oh my god, how did all of this happen?